...Meanwhile, Eve goes to Adalind to get answers that only a Hexenbiest can provide, and Renard confronts Nick about the mysterious symbols and tries to strike a deal. 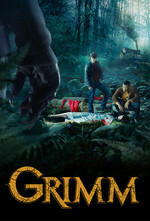 Den of Geek review - Grimm took on a weighty subject in a curious, not terribly effective way with "Blood Magic." A stellar episode with depth and a real sense of feeling for the community, hope the ending 3 gives a good wrap to the series. That's it? Bummer. I guess we're not going to get the showdown between Nick and Co. and this fellow which felt inevitable last season. thanks for that video! I completely forgot Killer Frost Caitlin was a dragon Dämonfeuer! I enjoyed this one; it's been a while since Nick had to ponder an uneasy split between his sense of duty as a cop versus as a grimm, at least when there wasn't some sort of emergency nipping at his heels. Everyone had to think about the merits of the status quo and what to accept or reject and the costs thereof. Yeah, this gave me all kinds of sad demented grandparent flashbacks. Can't say I enjoyed that feeling, but the show did it well.